Iconics stand the test of time; the forever relevant pieces which are kept in the wardrobe for years because of their premium fabric, attention to detail, and high-quality workmanship. NEW COLLECTION DNA PREMIUM This season, we continue to stand by our commitment to only ever use 100% organic cotton and recycled polyester because we believe that anything less isnâ&#x20AC;&#x2122;t premium. Weâ&#x20AC;&#x2122;ve given precedent to all the extra things that come together to create something beautiful. Premium is reflected in hood linings, special trims, exceptional metal-ware, the attention given to proportions, rich colour selection, the exact fabric weight for each product and the refusal to compromise on our standards in production. Premium is also present in the outstanding quality of service that comes with each of these products. SIMPLICITY This season, we’ve created clean lines and reflected high attention to detail in a collection that is forever relevant. Each piece is a go-to with an everlasting promise. It is an everlasting promise of comfort and style with items that are easy to wear and effortless to combine. Every style in our collection provides a strong sense of comfort and freedom of movement and makes the wearer feel instantly good. The moment of joy when a garment first touches the skin is cultivated through a considered process. First up, all our materials are organic – beautiful, and cosy. Every product from the collection is finished with softness at the core, which means selecting the right weight of fabric and deciding on the type of brushing that offers indulgence. Then there is the cut which is designed to work with each wearer’s mood whether it’s fitted, oversized or somewhere in between – fit will never mean forgoing on comfort. Our mission is to adhere to a responsible lifestyle, which is why we integrate sustainability into everything we do. As one of the world’s top organic cotton suppliers, we are certified to the highest levels and ethical in our sourcing and production. Modernity is more than a collection; it’s a way of thinking that ensures everything we do is relevant. We’re unveiling new styles, cuts and colours – all crafted to be totally modern and exploring new recycled fabrics that strengthen our efforts to become completely sustainable. We’ve also launched a brandnew web platform with cutting-edge advancements that work to improve your digital experience. Finally, we ensure that all seams are beautifully finished because we know that comfort lies in even the tiniest details. This collection will feature our commitment to 100% organic cotton but also a new recycled polyester blend. Recycled polyester will help offer more diversity in our collection, providing another unique opportunity to those who care about the impact of their actions. 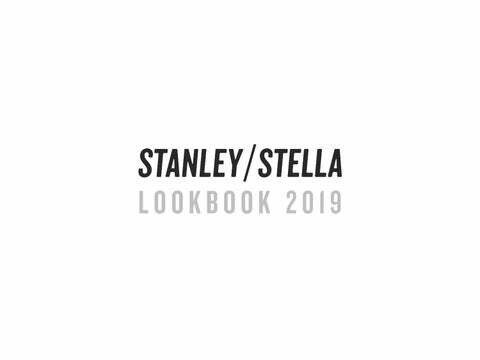 Whether it’s the in-house design team’s quick response to the latest high-street and catwalk trends or our efforts to embrace new movements in sustainability and digital technology, Stanley/Stella puts modernity first to ensure your loyalty. We are proud to reveal our new collection in this brand new 2019 Lookbook – we look forward to a successful year together! 9 NEW COLOURS This season, we’ve dared ourselves to incorporate flashier colours to surprise and support our customer in both collection and communication. We’re talking about a colour palette that both clashes and compliments ; pinks, blues, oranges, and greens come together for her, for him, for everyone. No tone is selected in isolation but works towards part of a bigger story, where the wearer can combine and express their personality. Against this pop of colour, there are desert neutrals and the reintroduction of the favourite denim washes. We’ve found ourselves inspired by nature’s weirdest wonders including chameleons and reptiles, who have the incredible ability to adapt their colour to their environment. We’ve looked to bold colours that stand out to make a statement in different contexts, whether it’s in the city or the suburbs. CRUISER The iconic unisex hoodie sweatshirt in premium brushed 350gsm fleece, 85% organic cotton, and 15% recycled polyester. Featuring a double self-fabric hood lining which offers sturdy and durable wear, plus matt silver metal eyelets, and draw cord tipping. There is twin-needle top-stitching and 1x1 ribs and armhole, a classic kangaroo pocket design and a half moon at back neck. Available in 16 colours. CREATOR This iconic unisex t-shirt is crafted from premium 180gsm 100% organic cotton single jersey and complete with our signature soft handfeel. It has classic proportions and stays true to our key DNA features. Featuring 2 needle 6mm durable top-stitching and available in 58 colours. CHANGER The iconic unisex crew neck sweatshirt crafted in premium brushed 350gsm 85% organic cotton and 15% recycled polyester. Featuring classic proportions and exhibiting all our DNA characteristics. Expect durable twin-needle top stitching at 1X1 ribs and armhole with herringbone neck tape and half-moon detail at back neck. Available in 17 colours. STELLA DREAMER The iconic women’s tank top is her ultimate wardrobe staple. A modern scoop neck tank top in 120gsm organic cotton complete with narrow binding at the neck and armholes, with 3mm 2 needle top-stitching. Available in 23 colours. STELLA LOVER STELLA LOVER MODAL The iconic women’s t-shirt is truly feminine with its refined self-fabric collar and 3mm 2 needle stitching. Choose from 45 colours in 120gsm organic cotton and 3 colours in 50% cotton 50% modal. STANLEY SPARKER The men’s heavy weight t-shirt, cut from 220gsm organic cotton, is sturdy yet provides a relaxed fit. Complete with a heavier rib construction and herringbone back neck tape for extra durability. Featuring 6mm 2 needle top-stitching across all 13 colours. STELLA EVOKER STANLEY PRESENTER Our classic V-neck t-shirts are available for both him and her. Both styles feature refined proportions and are designed with the perfect neckline with a self-fabric construction. His tee is 155gsm organic cotton, available in 10 colours and hers is 120gsm organic cotton, available in 15 colours. STANLEY SHUFFLER MINI HOPPER This iconic long sleeve t-shirt for men and kids features the same cut, fit, proportions, and soft handfeel as our Creator and Mini Creator. Fabric is 180gsm organic cotton for men and 155gsm organic cotton for kids. STELLA SINGER The iconic womenâ&#x20AC;&#x2122;s long sleeve t-shirt is cut in 120gsm organic cotton. It features the same neckline design and fit as the Stella Lover tee. Available in 9 colours. STANLEY DEDICATOR MINI SPRINTER The iconic men and kids’ polo features a clean front placket construction with 2 buttons. Inside herringbone tape at back neck and side slits at hem for reinforcement. The men’s polo is cut from 230gsm premium organic cotton pique and 220gsm for kids, with flatknit rib collar and sleeve cuff. Available in 15 colours for men and 6 colours for kids, with easy combinations. STELLA DEVOTER The perfect fit women’s polo in 95% organic cotton and 5% elastane. Featuring a flat knit collar and sleeve cuffs with a clean front placket and 2 buttons. Available in 10 colours. STELLA TRIPSTER STANLEY STROLLER This iconic men and women’s crew neck raglan sweatshirt is cut in 350gsm terry, 85% organic cotton, 15% recycled polyester, and features our durable and contemporary DNA details. Available for women in 21 colours and for men in 19 colours. STANLEY FLYER STELLA TRIGGER The iconic men and women’s hoodie raglan sweatshirt cut in 350gsm terry, 85% organic cotton and 15% recycled polyester. Featuring premium double self-fabric hood lining, clean proportions and durable details. Available in 18 colours for women and 21 colours for men, enabling easy combinations for everyone. STELLA EDITOR STANLEY CULTIVATOR The iconic zip-through hooded sweatshirts for men and women in 350gsm brushed fleece. Crafted from 85% organic cotton and 15% recycled polyester. Featuring premium matt silver trims and zip, with clean herringbone internal tape finishing at zip, double fabric hood lining, and twin-needle top stitching. Available in 10 colours for women and 12 for men. MINI RUNNER The iconic kids’ zip-through hooded sweatshirt in 300gsm brushed fleece. Crafted from 85% organic cotton and 15% recycled polyester and featuring premium details. Available in 7 colours that beautifully combine with the adult’s range. MAKER The essential unisex hoodie in 300gsm brushed fleece. Crafted from 85% organic cotton and 15% recycled polyester, and featuring single jersey hood-lining and flatlock stitching. Available in 8 colours. CONNECTOR The essential easy-to-wear unisex zip-through hoodie in 300gsm terry. Crafted from 85% organic cotton and 15% recycled polyester and featuring single jersey hood lining, flatlock stitching, and matt silver trims. Available in 7 colours. MINI CRUISER The iconic unisex kids’ hoodie is the perfect fit for kids ; a mini version of our adult’s unisex Cruiser. Available in 300gsm brushed fleece, 85% organic cotton, 15% recycled polyester and available in 9 colours. MINI CREATOR This unisex kids’ t-shirt in 155gsm organic cotton has our DNA soft handfeel. It’s a classic fit with 3mm 2 needle top-stitch and is available in 25 colours. It’s the perfect combination with the unisex adult’s Creator t-shirt. MINI CHANGER A mini version of the iconic Changer for adults, the iconic kids’ unisex crew neck sweatshirt is crafted from 300gsm brushed fleece, 85% organic cotton and 15% recycled polyester. This every day staple features our signature DNA durable details and is available in 10 colours and in easy combinations with the adults unisex Changer. * Size available on limited number of colours please check our webshop for latest information. Delicate fabric, follow washing instructions carefully. Indigo dyed product. Each garment may slightly vary in appearance. Body fabric may bleed into light prints, which gives a vintage effect. Delicate fabric, follow washing instructions carefully. Bottom hem with slight loose threads effect. Medium fit XS - S - M - L - XL - XXL* * Size available on limited number of colours please check our webshop for latest information. Fully lined with sherpa (sleeve included). As of Summer 19 season, this garment will be produced with recycled Polyester and will be available for delivery as per the stock availability. (** Indigo denim is indigo dyeBlack, Grey denim is black dye). Garment dyed product. Each garment may vary slightly in appearance. Indigo/black/solid dyed product. Each garment may slightly vary in appearance. Body fabric may bleed into light prints which gives vintage effect** (** Indigo denim is indigo dyeRoyal Blue denim is solid dyeBlack, Grey denim is black dye). ‘Produced with respect for people’. ‘Produced with respect for the planet’. We ensure that workers are properly paid, that there is no gender discrimination, and that building and fire safety standards are strictly adhered to. We are demanding – right through to the cotton we source from to the factories we trust. Our entire production chain complies with strict, forward thinking ecological and ethical standards. In Dhaka (Bangladesh), our 19-person team monitors our 5 partner factories every single day. Each of these factories is also audited by the Fair Wear Foundation, of which Stanley/Stella is a recognised member. Fair Wear Foundation is a non-profit organisation that works with brands, factories, trade unions, NGOs and, sometimes, governments to verify and improve work­place conditions for garment workers. They are active in 11 production countries in Asia, Europe and Africa. Fair Wear Foundation (FWF) membership is the beginning of a journey in which brands make step-by-step improvements that lead to real and sustainable solutions. Our collections are designed using organic cotton and recycled polyester (even our heather colours are 100% organic ring-spun cotton). We use a combination of these materials to achieve the super soft and full hand-feel needed for ultimate printability and enjoyment. Organic cotton is a natural, GMO-free fibre that uses less water than standard cotton. Its production does not involve the use of chemicals (no fertilisers or pesticides) and insists on the rotation of crops to keep soil healthier, more fertile and with maintained humidity. This means less risk to the health of farmers and villagers. When it comes to garment manufacturing, the cutting process naturally produces scrap material on which we work hard to ensures goes back into our products. At Stanley/Stella, we have a partner who collects and recycles these scraps into new cotton thread that we use in the manufacturing of our tote bags. At Stanley/Stella, we use recycled polyester to make our jackets – in fact, each windbreaker is recycled from up to 8 PET plastic bottles. We also blend recycled polyester in some sweatshirts, mixing it with organic cotton (up to 15%). We keep the softness against your skin, by locking the polyester into two layers of organic cotton. We work with factories that implement processes which treat industrial waste water for its reuse or safe disposal to the environment. Our mission is to safeguard the environment against pollution and contribute to sustainable development. Another used material is Modal®, which is biodegradable and made from eucalyptus or beech tree pulp. Eucalyptus is known for being a fast-growing wood that does not require irrigation, this makes it an extremely sustainable source. WE ARE CERTIFIED We are one of the biggest organic textile buyers in the world and are Global Organic Textile Standard (GOTS), OCS Blended and OCS 100 certified. In fact, sustainable, organic and social compliance are key commitments of Stanley/Stella. Our strict code of conduct in these areas provides decorators with environmental reassurances that your customers demand. Stanley/Stella cotton is GMO-free, that it is grown without the use of chemicals and is processed and dyed without using any banned toxic substances. GOTS also ensures compliance with the labour standards of the International Labour Organisation throughout the production chain. The Global Recycled Standard (GRS) label certifies that the materials used are recycled: in the case of polyester we reuse plastic bottles, and for cotton, we collect cutting wastage. GRS also guarantees compliance with social and environmental criteria such as the treatment of waste water, the absence of certain toxic additives and respect for working conditions in our partner factories. OEKO-TEX Standard 100 certifies the absence of harmful chemical substances in all Stanley/Stella products thanks to the “Confidence in textile” label. As of 2019, factories will also have to conduct GMO testing on yarn or fabric. Stanley/Stella garments are suitable for all forms of decoration; transfers, screen printing, DTG, embroidery, flocking. The super smooth surface of our garments means enhanced definition and less pre-treatment being required for Direct to Garment (DTG) printing. The very tight knit of our garments means that embroidery work stays flat, even on lighter weights. In addition to this, the printing surface of Stanley/Stella sweatshirts is 100% cotton and the 15% of recycled polyester that features in some products is always on the inside of the knitted fabric. We hold a huge depth of stock in main colours and styles, all of which is visible via our online professional account holder area, including real-time stock levels and inbound restocking dates. Current stock levels are displayed alongside our garments, giving you the peace of mind that your orders can be processed immediately. For size labels, we offer you a better layout for less confusion. 1	EU sizing bigger than US sizing. 2	Gender mentioned on the back side. This season, the style combinations across tees, sweats, joggers, and even jackets are bountiful and enable a play with colour and products to create unique looks. The promise is inclusiveness â&#x20AC;&#x201C; colour and styles that can be shared by men, women and even children. The goal is that everyone can play with products to create unique outfits which they can style just the way they want. WE ARE COLOUR SPECIALISTS Presenting our rich colour selection. Around 100 trendy colours and heathers to express your creativity. Discover our new Spring/Summer palette : Pink Punch, Sunset Orange, Black Heather Orange, Cotton Pink, Lavender Dawn, Desert Dust, Scale Green, Chameleon Green and Varsity Green. Against this pop of brightness, there are desert neutrals and the reintroduction of the favourite denim washes. And take a closer look at our Fall/Winter colours : Coral Wave, Crystal Stone, Purple Led, Lilac Peak, Midnight Blue, Off White. No tone is selected in isolation but works towards part of a bigger story, where the wearers can combine and express their personality. Enjoy!